USGA Rules Govern All Play except for the local rules. All Water Hazards will ba played as Lateral Water Hazards. Drop ball 2 club lengths from point of entry under penalty of 1 stroke. Out of Bounds – River on RED Course #1 and BLUE Course #4. GOLD Course #2, #3, & #4. RED Course #2, & #4. 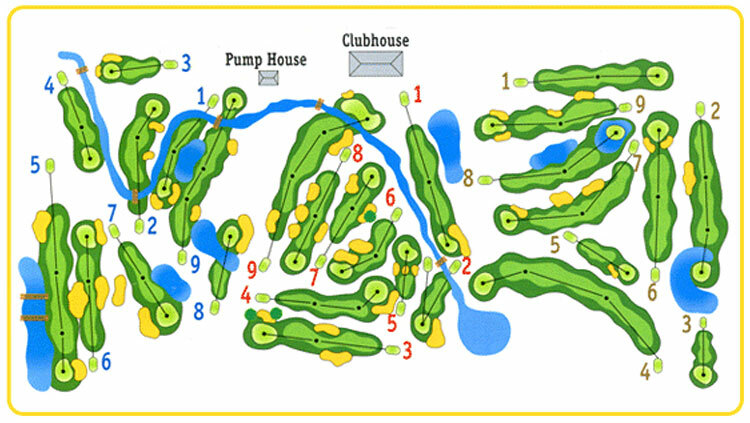 Drop Area provided on RED #2, and BLUE #1 & #2, under penalty of 1 Stroke. Repair Divots on Par 3 holes using sand boxes provided. Proper attire required at all times. No tank tops allowed. Playing without a shirt is prohibited. No coolers allowed on premises. Alcoholic beverages must be purchased on premises only.